Post-Brexit (yes, yes, I know I promised on Wednesday that I'd be moving away from Brexit posts, and you'll soon find I wasn't lying... completely), I've heard several arguments that boil down to "the European Union is good because unity will make Europe stronger. Just look at the United States! It was a mess under the Articles of Confederation, but came together to become a world power under the Constitution." The comparison is tempting and not without merit. Certainly, the United States benefited greatly when the sovereign States ceded some of their power--such as that over the coinage and printing of money and defense--to the national government. Putting the power to regulate interstate commerce eliminated the practice of States placing different tariff levels on British goods, for example, and aided in the creation of of a common national market. The formation of the Supreme Court, and the subsequent creation of the federal judiciary under the Federal Judiciary Act of 1789, allowed States to adjudicate disputes more fairly. Why couldn't Europe achieve the same "more perfect union" with its goal of "ever closer union"? "American nationalism derives primarily from a shared set of ideas." Unfortunately for Europhiles, the comparison breaks down quickly upon closer inspection. There are three key areas of difference between the United States and the vision of a "United States of Europe": common language and culture; a common legal tradition grounded in the rule of law; and a legacy of representative, democratic-republicanism. The young United States possessed these three qualities; modern Europe lacks them. The first point--common language and culture--will be a contentious one. There are myriad, if predictable, objections: Americans came from many sources, not just England; colonials expanded into territories that either belonged to American Indians, or to European competitors (notably the Dutch and the Swedes, but also the Spanish and French); settlers to different parts of British North America came from different cultural and religious groups in the British Isles; and so on. Indeed, German almost became the official language of a young United States. I discussed the ethnic and religious diversity of colonial and early republican America at some length in my essay "Created By Philosophy," and previously argued that American nationalism derives primarily from a shared set of ideas (in "American Values, American Nationalism"). However, despite this vivid and ubiquitous diversity, English culture and values ultimately became the overwhelming norm in British North America, and morphed into a distinctly American identity in the 18th century (though one that was, until independence, decidedly English). English may not be the constitutionally official language of the United States, but it is the lingua franca of the nation (and the world), and has been so for centuries. Every wave of immigrants (until relatively recently) has understood that mastery of English is a prerequisite to long-term success in and assimilation to American culture. English Protestantism--infused with Scottish Calvinism and German piety--was a unifying force in the colonies. When the First Great Awakening hit in the late 18th century, it cemented America's culture, even as it spawned multiple new denominations. The ultimate denominator, however, was a broadly Protestant Christian worldview (one that gradually and unevenly came to tolerate, and then to accept, Catholics, Jews, and believers and non-believers of all stripes). "English Protestantism... was a unifying force in the colonies." The story of America, ideally, is that of unity within a culture that values diversity of viewpoints, but insists upon an acceptance of a basic, common, Judeo-Christian morality; thus, "E Pluribus Unum." That morality, in turn, informs the legal system, one descended from centuries of English common law. Respect for the rule of law--the notion that no man, even the king, is above the law--guided the English people toward increasing freedom. 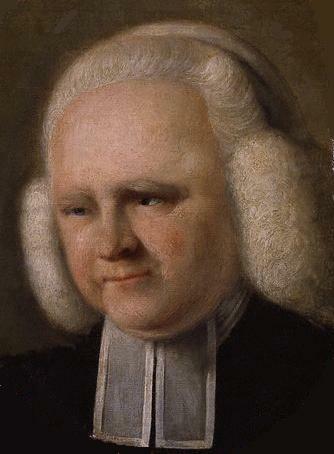 Evangelist George Whitefield knew how to preach to the masses of British North America, and he had the hair to prove it. Thus, we come to the English--and then American--commitment to representative rule. The United States really took the lead here, though Great Britain began expanding the franchise and reforming parliamentary representation in the 19th century as white manhood suffrage became the norm in Jacksonian America. (Here's a fun aside: there used to exist parliamentary seats that represented places with no people in them.) Regardless, the notion that the people should be represented in their government--and should be able to hold it accountable with fair, free, and frequent elections--is an important part of America's constitutionally-limited, representative, federal republic. Europe as an entity lacks all of these qualities. Yes, certain members states have some of these qualities to varying degrees, but the European Union as a whole is sorely lacking in these areas. - Culture and Language: The United States had the unique opportunity to create a nation afresh. Europe has had no such luxury, and seems to be inexorably divided into different languages and cultures. This division is not necessarily bad, but it makes unity much more difficult. It explains the natural struggle against "ever closer union," a struggle that is often visceral because people sense there is something artificial and disingenuous about the Europhile vision of a united Europe. There are, after all, still traditionalists living (and voting) throughout Europe. "[S]ecularism is the new, unifying religion of Europe." The long, oft-ancient histories of these nations makes it even more difficult for them to share a common worldview. Even secular, progressive Europe still experiences the lingering cultural effects of centuries of faith. France might have thrown out God with the French Revolution, but the "First Daughter of the Church" is still suffused, albeit in a subtle, weakened way, with centuries of faith. Such a faith culture, even hollowed out, will naturally, if imperceptibly, struggle to reconcile itself with that of other, contradictory traditions. I suspect this explains why the European Union seems hell-bent on advancing as many socially progressive causes as possible: secularism is the new, unifying religion of Europe. But there will always be push-back against this dehumanizing, nihilistic vision of man's place in the universe. Language, too, transmits the ideas and values of a people. I am no linguist, but--unlike French theorists like Jacques Derrida--I believe that words have power and transmit meaning. Such meaning is deep, part of the warp and woof of life. Why else would educated societies devote so much time to learning and analyzing language and literature? There's no need to read Shakespeare if you just want to a basically literate workforce. No, there must be some power in language. Linguistic diversity, therefore, is a beautiful thing, but it also means that different cultural values are transmitted differently throughout Europe. No one associates Russian, for example, with greater freedom and sober living. - Rule of Law: Of course different nations in Europe have rule of law (except Belarus). The European Union, however, does not. Yes, it might have European law, but this law is promulgated by an unelected committee of elites, figures who don't identify strongly with their nations of origin, but rather with a vague, secular-progressive idea of Europe, one that barely tolerates dissent or input from the people. Furthermore, how does one reconcile, say, French civil law with English common law? The deep divisions of history are huge hurdles to overcome. - Representative Government: As I've stated many times, the European Union is not representative. That's why the Brexit vote was so important, and why it has drawn so many comparisons to the American Revolution: the normal people of Britain rose up against an unelected, unaccountable elite and boldly proclaimed their right to self-determination. Brits seized back the ability to hold their elected leaders accountable. The elite, Europhile vision of a United States of Europe is one of non-representative, coerced redistribution. Give the proles bread and circuses, and they will submit on bended knee to the edicts of Brussels. Remember, the "Remain" side of the Brexit debate was primarily premised on maintaining access to EU goodies, not about the people's ability to choose such a course. Nothing could be further from the vision of America's Founders and Framers. They possessed a healthy skepticism about unbridled democracy, but recognized that the people were the source of government's authority; that the people govern themselves most effectively; and that the people should be able to hold their leaders accountable. Yes, liberty comes at a price--many prices, in fact. One of those is the ever-present risk that the people will make mistakes. Inevitably, they will. But a common, tolerant culture; a shared respect for the rule of law; and an understanding of the rights and responsibilities of republican government will guide voters to wisdom more often than folly. Self-government does not always fit neatly into the schemes of elite technocrats and busy-body regulators. But it ultimately makes for a happier, freer, and more prosperous society.